We pride ourselves on being the new kids on the block. We are locally owned and operated by an energetic staff that resides in Airdrie and the surrounding area. 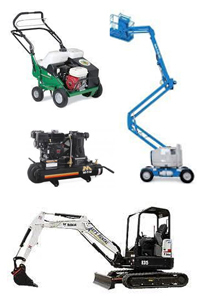 One Stop’s rental inventory consists of only the premium brands including Bobcat, Bomag, Genie, Hilti, Terex, Frost Fighter, Billy Goat, and Wacker Neuson. Take advantage of our NEW RENTAL FLEET to assist you with your next project’s success. New equipment is more efficient, and less likely to trouble you with timely breakdowns. Safety is our priority. Our aerial lifts undergo yearly inspections and certification, by an independent engineering company. All of our rental fleet is inspected and serviced by our experienced technicians prior to your rental. We are most proud of One Stop Rentals & Sales staff. You can take advantage of a combined equipment rental experience of over "40" years. If you have questions, we have answers. Ask for assistance or recommendations on the best tool for the job, or for simple instruction on how to use certain tools. If you don’t have the truck or trailer to haul your rental item, we do! Call us today for delivery, set up, and pick up. Our experienced drivers will get you your rental item on time, all the time. Call ONE STOP RENTALS & SALES TODAY at (403) 948-3373 for quality equipment rental in Calgary Alberta, Strathmore, Chestermere, Didsbury, and Airdrie AB. Check out our storage containers and moving rentals too!